Most people feel that the BassXX preamp is the most musically useful preamp they ever have used. Rather than being a volume booster, the BassXX is a filter-based pre-amp which provides very flexible parametric EQ control with sweepable mid and asymmetric responses. 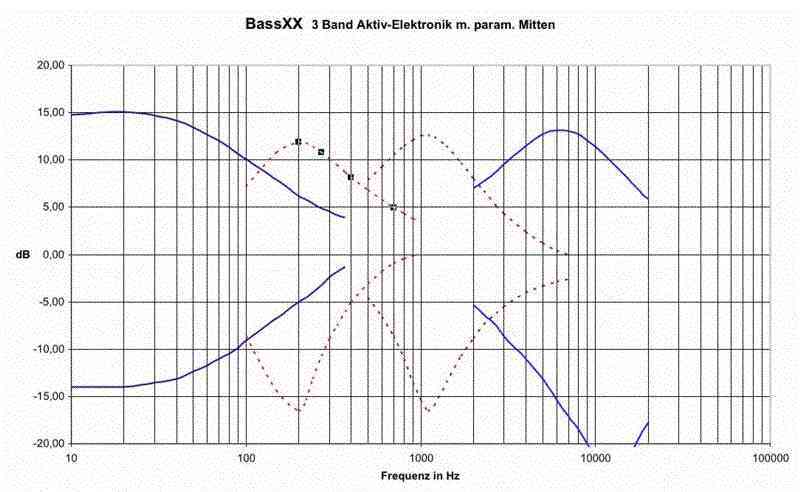 Since the BassXX is a filter-based preamp, you can bypass the preamp and go into passive mode. This is accomplished by pulling up on the treble knob. The passive sound is virtually identical to the active sound in tone and level if the EQ is set flat. In passive mode, only the volume controls function, but passive tone control can be added on custom instruments. Nevertheless, a wide variety of sounds are possible by mixing the two or more pickups, and your instrument can also include series-parallel or single-coil options. 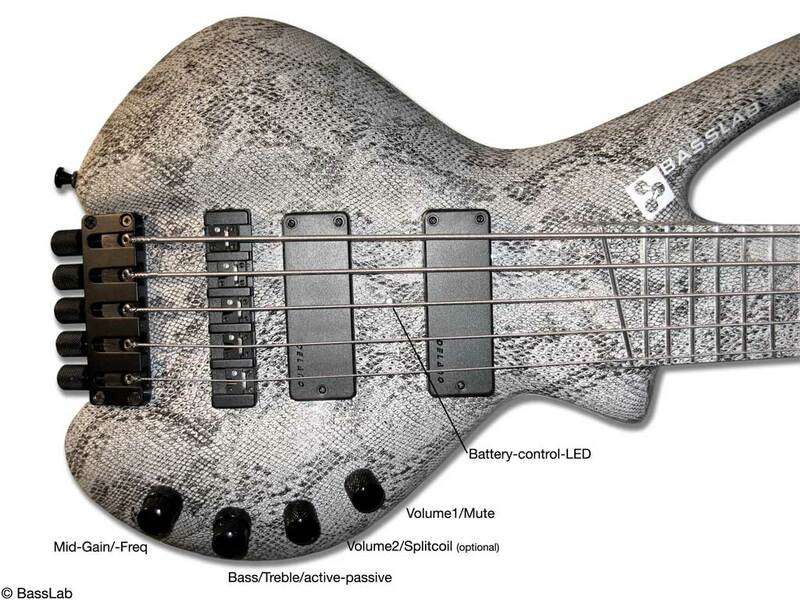 The mid control on the BassXX is very powerful. By sweeping the frequency with the gain turned up, you can achieve a strong wah-wah effect. On this instrument, the mid frequency and mid gain are separate knobs, but a single stacked knob is the current configuration. The battery charge control LED flashes when approximately 2 hours of clean power remains. • Polyester capacitors with low tolerance and high linearity replace ceramic and tantalum condensers in the signal path. No semiconductor switches in the circuit. 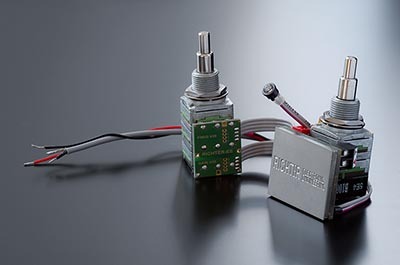 • The use of excellent potentiometers. For the combined Bass- and treble control with active/passive-switching, we use MEC, for the parametric mids with frequency- and level-control ALPS (two single pots) - optional : MEC (one stacked pot), which are completely encapsulated, ruggedly designed and shielded. • Intensive audio tests lead to the actual variation of frequencies and level ranges. • The circuit is completely shielded and encapsulated. • Neutral switching: Switching from active to passive can be done with the push-/ pull knob of the integrated stacked potentiometer without changes in volume level (while knobs are in neutral position). - One concentric potentiometer for the parametric mids instead of two ALPS potentiometers. Installation and user manuals can soon be found here.